A hint about who’s at the top: the platform that offers sports. 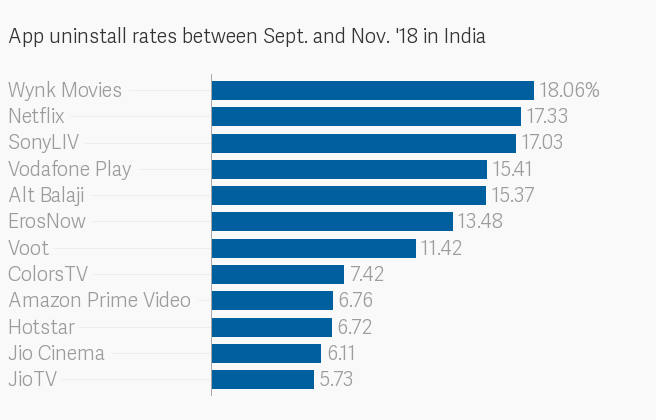 Hotstar is crushing its competition in India. Over 45% of India’s smartphone users had the homegrown video-streaming app installed on their phones between June and November 2018, data from Delhi-based market intelligence firm Kalagato show. The survey included around 1.5 million smartphone users in the country. The year 2018 was also a solid year for the industry overall. 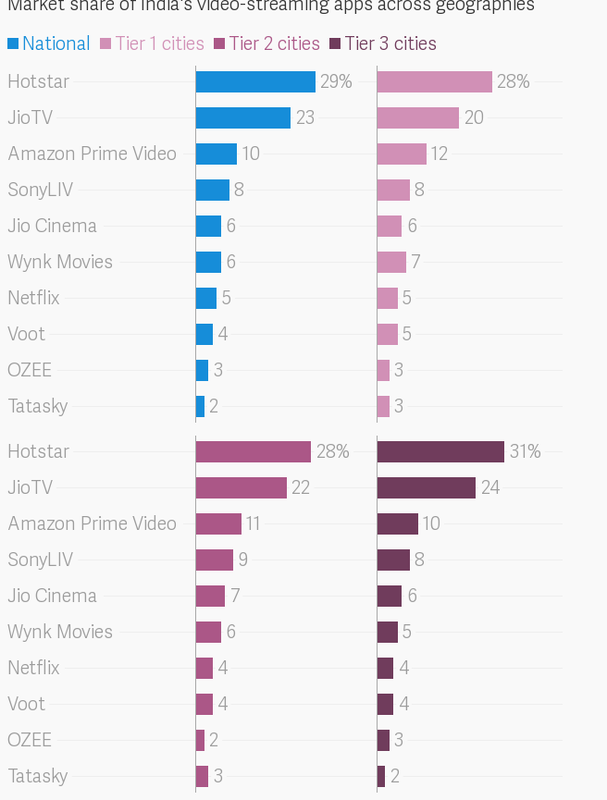 Most over-the-top video players increased their share in the four-month period starting in August, especially Amazon Prime Video, SonyLIV, and Netflix. And the competition has been hotting up. “Platforms like Alt Balaji are famous among Indian housewives due to their impressive library of regional shows that suit their mindset,” said Subrat Kar, CEO of video analytics startup Vidooly. “Hotstar, on the other hand, provides sports, and Indian TV soaps, including many shows from media houses like HBO and Star.” Netflix is spending big time on originals and Amazon has been upping its regional content game. Besides Hotstar, the other content king that has emerged in India’s OTT market is JioTV, which was installed on over 30% of Indian smartphones, according to Kalagato. JioTV, a live TV app specifically available to customers of Mukesh Ambani’s telco upstart Reliance Jio, launched on Aug. 15, 2018, has beaten the likes of Vodafone Play and AirtelTV by offering over 600 free live TV channels. 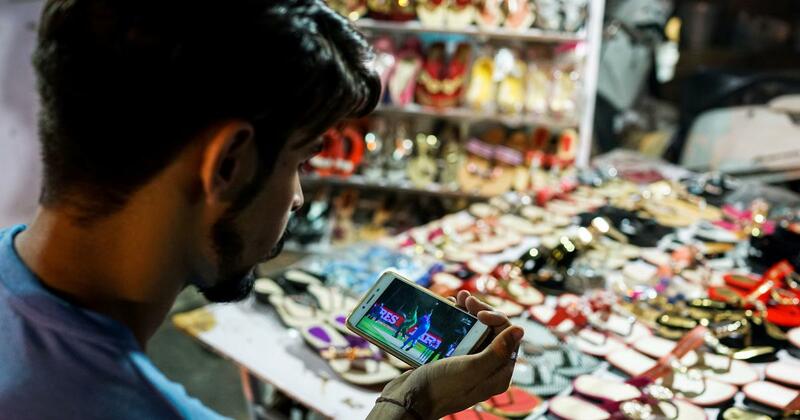 JioTV as been able to penetrate so much of the market because it “comes pre-bundled with Jio’s devices and SIMs”, Aman Kumar, chief business officer at Kalagato, told Quartz. “It’s (JioTV’s) perhaps a bigger threat to Hotstar than an Amazon or Netflix because its distribution network is very strong,” Kumar said, adding that the conglomerate run by India’s richest man can afford to splurge on customer acquisition as it can cross-subsidize the cost of one customer across many of its other products. In fact, JioTV has been so bullish at driving customer adoption that it actually captures a larger share in tier 3 cities, where smartphone penetration is sparse and network spotty. Following Jio’s success in reaching rural India, ErosNow recently partnered with telco Bharat Sanchar Nigam to take its content to villages. Perhaps the only player still struggling is Netflix. 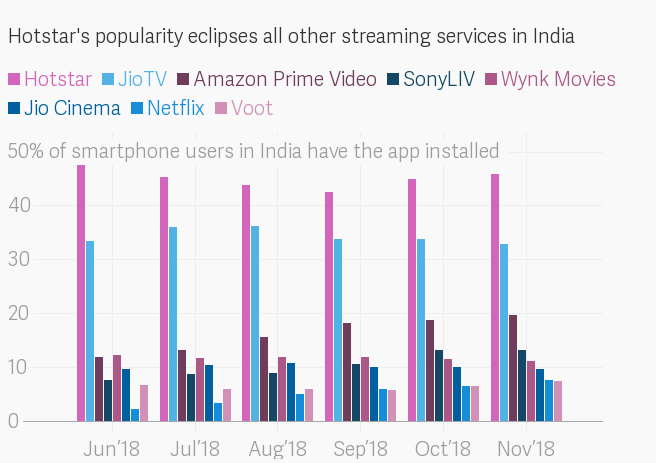 The data show that Netflix not only has a smaller reach—it is installed on less than 7% of smartphones in India—but users aren’t loyal to the platform either. “Sacred Games did touch the sweet spot of Indian viewers, but one show is not enough,” said Kar of Vidooly. The Los Gatos, California-based streaming giant has to keep up efforts in the country if it wants to make a mark. It has already allocated Rs 600 crore to churn new content out of India. However, there is one bright spot for the company: Baiting users may be a battle but keeping them hooked comes easy. Netflix has the highest net promoter score of 0.67 compared to its rivals. 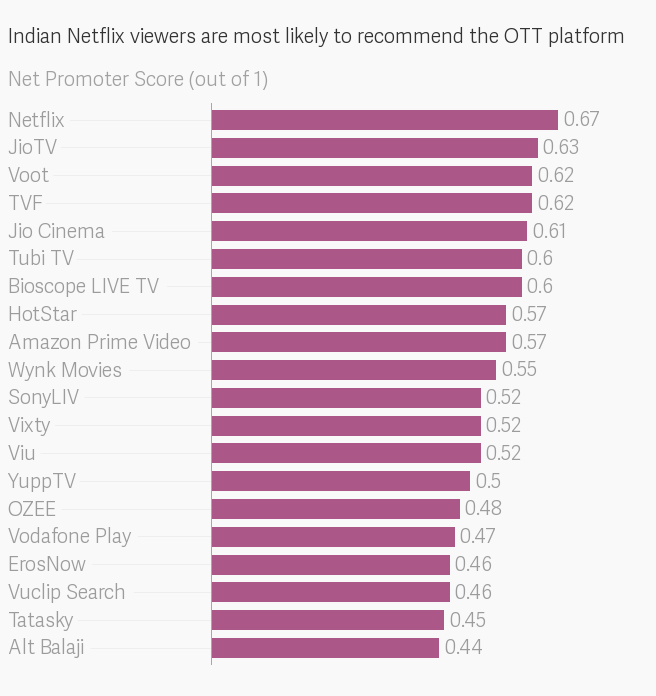 This means two-thirds of Netflix users in India would recommend the platform to others.